Unobstructed sea views, easy access to Mykonos Town and the most cosmopolitan beach of the island nearby - you'll find it all at Villa Linda. Built into a rocky hillside in Agios Lazaros, the most envied location on the island, this welcoming luxury Mykonos villa offers a bird's-eye view over the sea and the neighboring islands, combining total serenity with the wild party soul of Psarou Beach nearby. Gather a group of 8 and get ready to spend your vacation relaxing on Linda’s spacious terrace with friends and family, before you hit the road to explore Greece’s most iconic island. What's the best place to take in the incomparable views? You’ll have to choose for yourself between the loungers in front of the infinity pool, the pergola-shaded lounging areas or the two alfresco dining tables. 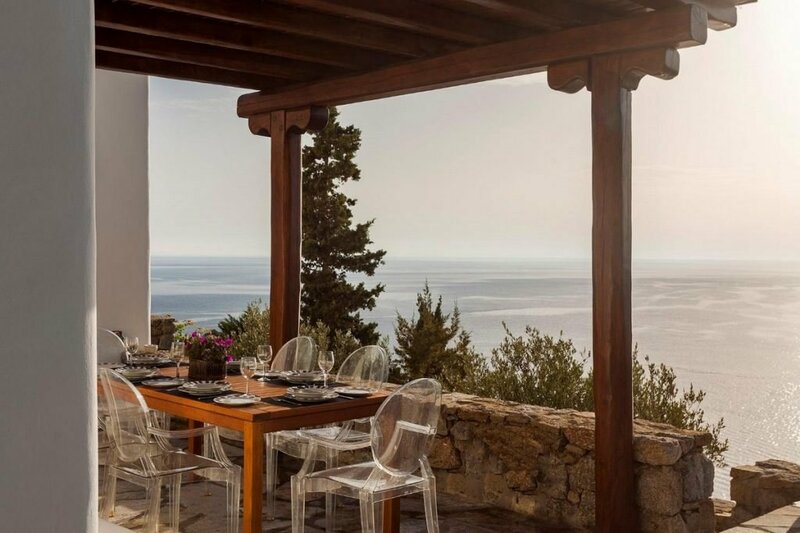 Your terrace also features a wood-fired BBQ, where you can prepare finger-licking Mediterranean meals for your loved ones and enjoy them with the most breathtaking view on the island. And if those are not enough for an unforgettable summer, a few stone steps within the resort will take you to a rocky dock with sunbeds, where you can enjoy the sun and refreshing plunges in the sea. Does it get any better? Design Τhe inviting vibe continues throughout the subtle interiors, which blend traditional elements, eclectic furnishings and modern finishes. The TV in the modern living room offers Netflix services, so the kids can entertain themselves with a movie while the grown-ups prepare a group meal in the fully equipped kitchen, before you all enjoy it together at the open-plan dining room. Are you ready to get seriously spoiled? The villa’s 4 luxury bedrooms feature every amenity to make you feel like home; queen size beds, en-suite bathrooms and balconies with impeccable view will offer you a good night’s sleep and travel your senses. Sit back and enjoy! Personalized services is what we are famous for, so if you want to explore the island in depth, all you have to do is trust our award-winning concierge, who will be available 24/7 to fulfill your every wish. If you want to indulge yourselves with a yacht tour around the island or with a meal at a fancy restaurant, she’ll be the one to arrange it for you. If you don’t want to leave your comfort, all you have to do is drop a line and our chef will be knocking on your door in no time to prepare a delicious dinner at the privacy of your villa! Linda is part of a luxury villa complex located in Agios Lazaros, perhaps the most sought-after part of Mykonos, close to some of the island’s most famous beaches. The complex is CCTV monitored 24/7 and features an independent alarm system, back-up generators to face unexpected power cuts, a helipad and a private jetty. Dear luxury, nice to meet you!